4814 Chillie Lane, Sandston, VA 23150 (#1831671) :: Abbitt Realty Co.
Only two more available lots! 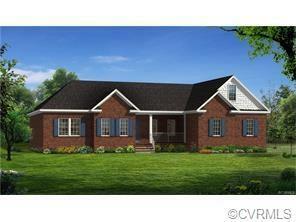 Brand new, high quality, all brick one level home on a one acre lot in Henrico County! Incredibly popular and sought after split floor plan with deluxe master suite at one end of the house, two bedrooms at the other, and optional 4th bedroom over the two car garage. Standard features will include granite counter tops, hardwood floors (family room, dining area, kitchen and breakfast nook), upgraded trim work, gas fireplace, custom made birch cabinets and vanities, concrete front and back porches and sidewalk, and more quality features that would be considered upgrades elsewhere! Two 1+ acre lots to choose from as well as the opportunity to choose or design your own plan. Looking for a first floor master suite? No problem. Excellent location on the east side of Richmond, close to New Kent County and offering easy interstate access for quick commutes to downtown Richmond, Williamsburg, Richmond International Airport and plenty of shopping and dining options. Legendary H.F. Robbins, Jr Construction Company has been building high quality homes in Virginia for decades and is the exclusive builder for Csiki's Acres. Listing courtesy of Seay Real Estate. Listing information © 2019 CVRMLS and CBRAR.